schön zu sehen, dass es noch einige weitere Nordkorea-Interessierte gibt. Plane selber im nächsten Jahr in dieses geheimnisvolle Land zu reisen und freue mich natürlich schon sehr. Dennoch habe ich mal eine Frage an Euch. Ich sammel seit vielen Jahren verschiedene "Propaganda"-Poster aus diversen Epochen. Leider jedoch besitze ich kein einziges aus Nordkorea. Nun bin ich durch Google natürlich auf die Website getroffen und sah, dass man dort die gezeigten Poster bestellen kann (was sich nach zweiten Lesen als "nicht aktuell" erwies). Daher nun die Frage, ob Ihr mir eventuell sagen könnt wo man diese Poster (oder zumindest einige) kaufen/bestellen kann.Alternativ würden mir in letzte Not auch Bilder (z.B. im jpg-Format) in hoher Auflösung reichen. Ein professioneller Posterdruck wäre mir aber natürlich lieber. Schonmal danke für die hoffentlich zahlreichen Tipps ! Pyongyang, January 7, 2011 (KCNA) -- A poster exhibition was opened at the Pyongyang International Cultural Center on Friday to carry through the militant tasks set forth in the joint New Year editorial. On display are more than 60 posters which reflect the idea and spirit of the joint editorial. They were created by artistes of the Mansudae Art Studio, the Pyongyang University of Fine Arts, the Korean Central Fine Art Studio and the Fine Art Studio of the Ministry of Railways amid the stirring reality. Among them are posters "Bring about a decisive turn in the improvement of the people's standard of living and the building of a great, prosperous and powerful country by accelerating the development of light industry once again this year!" and "Produce commodities to be favored by people and competitive on the world market!" They call on all the party members and other working people to wage a dynamic drive for implementing the tasks set forth in the joint editorial. Posters of diverse themes include "Let hasten the construction of the Huichon Power Station for happiness of the people at the maximum speed!" "Let us conduct a vigorous emulation for drastically increasing the per-unit grain yield!" and "Let all Koreans in the north, south and abroad join efforts to open a new phase of independent reunification!" Officials concerned, producers of art works and working people in the city looked round the exhibition. Plakate kann man sehr gut in Pyongyang kaufen. Im Zentrum ist ein grosser Buchladen, wo es auch Bücher, CDs und DVDs gibt. Sehr grosse Auswahl. Auch im Hotelbuchladen im Yanggakdo-Hotel. Sehr schön sind gemalte Plakate zu den Arirang-Festspielen. Die aktuellen Wahlplakate können bei mir per Email oder PN bestellt werden (je Poster: Acrylfarbe auf Papier: 50 EUR, Acrylfarbe auf Leinwand: 100 EUR, zzgl. Versandkosten). The Workers' Party of Korea Publishing House created a poster "Everybody to carrying out the tasks laid down in the joint editorial for this year!" The poster depicts a worker calling for effecting a high-pitched drive for a fresh revolutionary surge, holding high the torch kindled in South Hamgyong Province and thoroughly implementing the militant tasks set forth in the joint editorial of the newspapers of the party, army and youth league. It shows the spirit prevalent in all domains of the national economy including light industry, agriculture and key industries which are dashing like wind under the uplifted red flag which bears letters reading "Industrial revolution in new century", "General offensive in production", "Improvement of people's living standard" and "Thorough implementation" reflecting the idea and spirit of the joint editorial. The Workers' Party of Korea Publishing House produced a poster "Forward for general offensive in response to Party's call!" The poster depicts the serviceman and people all out in the general offensive against the background of Songun Chollima flying high in response to the flames of Hamnam. The poster which reflects the militant call of the party with appealing stroke ardently calls upon all the servicepersons and people to bring about great renovations and leap forward in all fields for the building of a thriving nation to honor the pledge made before the bier of leader Kim Jong Il. Posters on the 14th Kimilsungia Festival and the Kimilsungia-Kimjongilia Exhibition have been produced. They will be held with splendor to mark the centenary of the birth of President Kim Il Sung (the Day of the Sun) and the 80th birthday of the Korean People's Army. The poster on the festival depicts the old home of the President in Mangyongdae and the immortal flowers against the background of the blue sky over the country. Seen in its upper part are the letters "The great leader Comrade Kim Il Sung will always be with us" and in its lower part letters "The 14th Kimilsungia Festival." The poster on the exhibition depicts the flowers of the sun against the background of Mt. Paektu and deep forest. Seen on the poster are words "Celebration of the 80th birthday of the Korean People's Army" and "The Kimilsungia-Kimjongilia Exhibition." Logos of the festival and exhibition, places and periods are given on them. 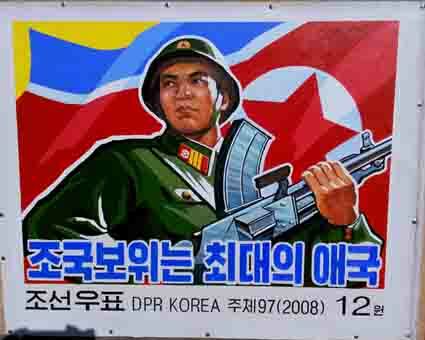 Posters on the World Congress on the Juche Idea were produced in the DPRK. The Congress is to be held with splendor in Pyongyang on the occasion of the birth anniversary of President Kim Il Sung. The posters reflect the unanimous aspiration and desire of the followers of the Juche idea and progressive humankind to victoriously push forward the socialist movement and global independence, guided by the Juche idea. A poster depicts the Tower of the Juche Idea and Kimilsungia and Kimjongilia in full bloom against the background of the globe. It deals with the fact that thanks to the Juche idea, the original revolutionary philosophy, there came a new era in the development of human history, the era of Juche in which the popular masses carve out their destiny independently and creatively. There is also a poster depicting people holding "Kim Il Sung's Selected Works" and leader Kim Jong Il's works "On the Juche Idea" and "On Some Problems of Education in the Juche Idea" in their hands and the Chollima Statue. It reflects the firm will of the Korean people and progressive mankind to actively study and disseminate the Juche idea which is evoking strong support and response among the world people for its truth and tremendous vitality and invariably advance along the road of Juche. The words "World Congress on the Juche Idea" and the logo of the Congress are seen on the posters. It vividly represents a serviceman, a worker, a farmer and an intellectual out in the drive to realize the noble intention of the dear respected Kim Jong Un, flying the flag of the Workers' Party of Korea. Seen on the poster are words "Single-minded unity," "Invincible military capability" and "Industrial revolution in the new century" which reflect a strategic line for building a thriving socialist nation. It calls upon all the service personnel and people to advance full of confidence towards the final victory in the cause of building a thriving nation, united close behind the great party. Pyongyang, January 1, 2013 (KCNA) -- The Workers' Party of Korea Publishing House produced posters encouraging the army and people of the DPRK who turned out in the advance for the New Year. Poster "Let us leap higher and faster riding a fleet steed of science and technology!" portrays satellite Kwangmyongsong 3-2 flying in space fully demonstrating the space science and technology of Juche Korea and its overall national power, and a scientist calling for pushing back the frontiers of latest science and technology. It calls for making great innovation and surge in all fields of building a thriving nation with the same spirit with which scientists and technicians who manufactured and launched the Juche-based working satellite and fully displayed the dignity and might of Songun Korea. Also produced is poster "Toward Sepho tableland, a large-scale stockbreeding base!" It deals with the revolutionary stamina of all the army and people determined to build another socialist land of bliss in Kangwon Province by successfully carrying out the party's grand nature-remaking plan. Hier eine aktuelle Liste verfügbarer politischer Poster (gemalt, nicht gedruckt). Zunächst in koreanischer Sprache, dann in englischer "Google-Übersetzung". Format jeweils ca. 56*80 cm. Preis jeweils 100 EUR zzgl. Versand aus Nordkorea. 6.15통일시대의 흐름은 가로 막지 못한다! 군자리혁명정신을 발휘하여 우리 식의 다양한 군사적타격수단을 더 많이! 기념비적건축물들을 최상의 수준에서 최대의 속도로! 나라의 자립적경제토대가 은을 낼수 있게 석탄과 광물생산, 철도수송에서 련대적혁신을! 농산, 축산, 수산부문에서 혁신을 일으켜 인민생활개선에서 전환을! 로농적위군, 붉은청년근위대는 전투정치훈련을 힘있게 벌리자! 만리마속도창조의 불길높이 사회주의완전승리를 향하여 총공격 앞으로! 서로 돕고 이끄는 집단주의적경쟁열풍속에 더 높이, 더 빨리 비약하자! 설비, 원려자재의 국산화를 중요한 정책적문제로! 애국풀을 대대적으로 심어 풀과 고기를 바꾸자! 양어장과 남새온실, 버섯생산기지들이 은이 나게! 우리의 땅, 바다, 하늘을 0.001미리라도 침범못한다! 전국 도처에 건설한 양어장들이 은을 내게 하자! 체육을 대중화, 생활화하여 온나라가 체육열기로 들끓게 하자! 최첨단의 새로운 경지를 개척하기 위한 연구사업을 심화시켜나가자! 축산물과 과일, 온실남새와 버섯생산을 늘이자! 핵무력건설의 력사적슬리를 도약대로 혁명적인 총공세를! 혁명적인 총공세로 사회주의강국건설의 모든 전선에서 새로운 승리를 쟁취하자! Sogar 1W Strom kann so viel wie möglich eingespart werden! 6.15 Der Fluss der Ära der Vereinigung kann nicht blockiert werden! Lassen Sie uns ein ringförmiges Produktionssystem aufbauen. Verbessern wir die Qualität der Bildung! Wir entwickeln und produzieren leistungsfähigere Waffen unserer Art im Verteidigungssektor. Die Internationale Atomenergiebehörde sollte aufhören, als US-Soldat zu dienen! Der revolutionäre revolutionäre Geist der Militärrevolution, wir haben verschiedene militärische Mittel, um mehr zu blasen! Wir modernisieren die Maschinenfabriken und sichern die Produktion verschiedener Maschinen mit hoher Qualität. Baue monumentale Gebäude auf höchstem Niveau und mit maximaler Geschwindigkeit! Wir sind der Besitzer der Farm, die für die Reisnudeln des Landes verantwortlich ist. Die sich selbst erhaltende wirtschaftliche Grundlage des Landes ist eine revolutionäre Innovation in der Kohle- und Mineralienproduktion. Lassen Sie uns alle fliegenden Menschen loswerden. Gehen wir auf den Grund des Kampfes zwischen den inneren und äußeren Schlachten. Innovationen in den Bereichen Landwirtschaft, Viehzucht und Fischerei werden das Leben der Menschen verändern! Beenden wir den Bau des Kraftwerks Wangchol! Besetzen wir das alpine Hochland, indem wir die Fläche von zwei landwirtschaftlichen Feldern vergrößern. Ronin Deklination, Roter Jugendwächter, lasst uns Kampfübungen verbreiten! Die Größe des Feuers der Schöpfung der Großen Manmia. Amerika ist eine Nation der Äxte des Bösen. Springen Sie nicht in die falsche Richtung! Kämpfen wir alle Kriegsmanöver, einschließlich der rassischen Einheit, der großen Einheit und rücksichtsloser militärischer Übungen mit fremden Mächten. Beenden wir Baekdus Blutlinie bis zum Ende der Revolution von Juche. Lasst uns in einem kollektiven Wettbewerbsrausch höher und schneller springen, um uns zu helfen und einander zu führen! Die Lokalisierung von Geräten und Materialien ist ein wichtiges politisches Thema! Lassen Sie uns das Gras und das Fleisch ändern, indem Sie in großem Maßstab patriotisches Gras pflanzen! Lass uns den Fisch aktivieren und formen! Fischfarmen, südliche Gewächshäuser und Produktionsstätten für Pilze sind Silber! Ein neuer athletischer Mythos vom Helden Joseon! Die gesamte Nation wird sich zusammenschließen, um die Einheit der Einheit zu öffnen. Lassen Sie uns alle möglichen ungewöhnlichen Dinge wegfegen. Besiegen wir fremde Mächte und beobachten Sie unsere nationale Identität. Wir können unser Land, das Meer und den Himmel nicht in 0,001 Millimetern eindringen! Wir können unseren Weg nicht aufhalten. Lassen Sie uns die Stahlnachfrage der Volkswirtschaft befriedigen! Lassen Sie uns die öffentliche Gesundheitspolitik erblühen! Beenden wir das Wiederaufleben des japanischen Militarismus. Nehmen wir zuerst die Kraft und los geht's! Bereiten Sie sich auf den Kampf gegen Mantan vor, damit jeder seiner Feinde mit einem Schlag getroffen werden kann. Fischfarmen, die überall im Land gebaut wurden, lassen mich Silber haben! Lassen Sie uns eine landesweite Produktionsorganisation schaffen! Krieg und Fußzeilen auf dem Weg! Wenn der Krieg passiert, wird Amerika nicht überholt. Nehmen wir die Weisheit und den Mut der Koreaner zusammen. Die Gründung der Demokratischen Volksrepublik Korea. Beenden wir die Kriegsgefahr und schützen Sie Frieden und Sicherheit auf der koreanischen Halbinsel. Zehn Millionen Menschen versprechen tausendmal Rache. Lassen Sie uns die Eisenbahn modernisieren und mehr neue Lokomotiven, Reisebusse und elektrische Züge herstellen. Lassen Sie uns das ganze Land zu einem sportlichen Enthusiasten machen, indem Sie Leichtathletik populär machen und leben! Total Hutan, vor der Einheit! Lassen Sie uns Forschungsprojekte vertiefen, um wegweisende neue Felder voranzubringen! Vieh und Früchte, Gewächshäuser Wir werden weiterhin Pilze und Pilze produzieren! Machen wir uns mit den Eindringlingen lächerlich. Brechen wir die Betonbarriere ab und vereinen Sie unser Land! Ich habe einen ausgewählt und einen ausgewählt. Lasst uns in allen Fronten des sozialistischen Machtaufbaus mit revolutionären Schüssen einen neuen Sieg erringen!